TWO WEEKS?!? It must not have been very exciting, but here goes. Thursday, June 14: Drove a load of kegs via the Columbus-Duncan-Columbus-Norfolk-Columbus-Duncan-Columbus route. Made 14 barrels (434 gallons) of root beer. Friday, June 15: Picked up Paris in Omaha. Stopped by Crescent Moon for lunch and Beertopia for beer to take home. Saturday, June 16: Filled kegs for Monday's deliveries. Sunday, June 17: Drove Paris to Omaha. Bemoaned the fact that Crescent Moon isn't open on Sundays. Monday, June 18: Drove more kegs to Norfolk. Cleaned about six dozen kegs. Kegged off the remaining two barrels of Dunkelweizen and cleaned the empty tank. Tuesday, June 19: Filtered the All-American Gold into one empty tank, and the Rye I Oughta...! rye lager into the other one. Half of the Rye's filtration went well, but the filter bed started leaking through, so I just ran the rest of the beer in and called it "semi-filtered". Wednesday, June 20: Cleaned the draft lines. Thursday, June 21: Did the mid-month taxes, filled kegs, and cleaned the two empty fermenters. Friday, June 22: Picked up Paris in Omaha. Had lunch at Crescent Moon and stayed there until it was time to head downtown to pour beers at the Omaha Summer Arts Festival. Spent the night in Council Bluffs. Saturday, June 23: Drove home from Omaha. Sunday, June 24: Drove back to Omaha to pour beers at the Omaha Summer Arts Festival. Stopped by Dundee Dell for dinner and beers before heading home again. Monday, June 25: Did not drive Paris to Omaha; took her to the doctor instead. She's got some sort of throat infection (which she was kind enough to share with me) and her doctor told her not to fly. Tuesday, June 26: Made 14 barrels of root beer. Filled a few kegs. Wednesday, June 27: After my doctor appointment this morning, I stopped by the hardware store for some maintenance-type things and tools. Called Denver Plastics about getting a couple thousand more dust caps for the root beer kegs, since our four-year supply is just about exhausted. Tomorrow: Clean draft lines, fill kegs. The second Cruise Night of the year will be held Thursday night in the pub's parking lot. I enjoy Psychostick's "The Beer Song". I really can't think of anything else to say. Looks like Japan is ready for a BJCP branch. Their numbers may still be small but there is growing interest among Japanese men and women in becoming licensed beer tasters. Participants in a seminar for prospective beer tasters sample different brews in Tokyo's Sumida Ward in March. Since a certification exam was instituted 12 years ago, more than 5,000 people have passed the test given by the Japan Craft Beer Association and become certified beer tasters. The association, based in Nishinomiya, Hyogo Prefecture, was founded by Ryoji Oda in July 1994 to popularize and promote beer tasters and craft beers in Japan. It also holds seminars to teach students how to evaluate beer. A sister group called the Beer Taster Nonprofit Organization also aims to promote the culture, history and technology of beer. Read the entire article at The Japan Times. The town of Hinton, Australia is under water after recent heavy rains, but they received a shipment of their most-urgently needed supplies this week. The murky brown water, the authorities said, contained sewage and other pollutants, but its 400 inhabitants were more worried about a lack of beer. A plentiful supply was required to celebrate a much-anticipated rugby league match between New South Wales and Queensland yesterday. For days State Emergency Service volunteers had been ferrying staples such as bread and milk to the stranded town in flat-bottomed boats. Yesterday, they added 12 kegs and 36 cartons of beer to their cargo. "They'll be able to watch the game and have a cold one tonight," said Philip Campbell, a SES spokesman. Read the entire article at Telegraph.co.uk. Chef Sang Yoon sounds like my kind of guy. Sang Yoon is a chef. Sang Yoon is also a Korean-Russian hockey-playing beer provocateur who lives a short drive from his Santa Monica bar and restaurant, Father’s Office. At Father’s Office, Yoon keeps 36 craft beers on tap at all times; as if that weren’t enough, at his house he also has three more beer taps, directly connected to kegs, in his kitchen. When Yoon tells me this, I say something like, "You have beer taps in your kitchen?" and he gives me a look that seems to say, Of course—why wouldn’t I? The rest of the article (at Food & Wine) describes a tour of northern California breweries and explanations on why the beers they tasted accompany food better than wines. That whirring sound you hear is Arthur Guinness spinning in his grave. Diageo Plc said today it was reviewing brewing operations in Ireland after media reported the drinks giant may quit the Dublin city centre site where Guinness has been brewed for almost 250 years. The site, where Arthur Guinness took out a 9,000 year lease on a disused brewery in 1759, has grown into what the brewer now describes as "a prime 64 acre (25 hectare) slice of Dublin". The Sunday Independent reported the land could fetch as much as €3 billion if Diageo implements plans to move production to a greenfield site on the outskirts of the capital. "Heineken". It’s the reason you give to immigration officers when asked why you’re visiting Holland. What trip here is complete without a visit of the Mecca of the beer world?? One of the must see place’s for all you malt lovers out there is the original Heineken brewery in Amsterdam. Between 1930-1988 this famous (and very good indeed) beer was made right on this spot. Now on the building is the Heineken Experience beer museum. Read the entire trip report at Ultimate Beer Quest. Today's big project was filling 30 five-gallon kegs and 20 half-barrels of root beer for Norfolk. Only I ran out of root beer with five half-barrels to go. Adam said he'd get me some emergency backup sugar tomorrow, so I'll be able to make enough root beer to keep the pub going through the weekend as well as finish this order, plus Grand Island's order. Yesterday's brews are fermenting happily away. So much so, that in the spirit of lolcats, I present to you now the Internet's first-ever lolyeast! Leave it to the BBC to point out the stupidity and injustice of America's prohibitionist liquor laws. [W]hat Elisa Kelly does know is that she will be [in Albemarle County jail, Virginia] for two-and-a-quarter years. It is a relatively short sentence compared to the murderers and rapists with whom she paces around the narrow, pit-like courtyard once a day for 10 minutes. You might argue that Elisa Kelly, who shares her cell with nine other inmates, is lucky, because her original sentence of eight years was slashed to 27 months after a lengthy and costly appeals process which finally hit a dead end when the US Supreme Court refused to hear her case. "It's absurd. It's an injustice," she told me with red eyes that matched her uniform. "My boys don't just think I'm a good mother. They think I'm the best mother!" Elisa's crime was to hold a birthday party for her 16-year-old son Ryan and serve his friends beer. As a precaution, she and her ex-husband, who is serving 30 days for bringing the alcohol onto the property, made sure that none of the kids would be able to drive home. As they arrived at their 6000ft suburban mansion on the outskirts of Earlysville, she confiscated their car keys, put them in a bucket, barricaded the drive with her Hummer and told them to have a good time. They were all expecting to have a sleep over and, since Elisa knew most of the kids because she had taught them at school, she did not think it was necessary to warn their parents that beer would be consumed. At about 10pm the din of music and boys' voices was drowned out by police sirens. Read the entire excellent article at BBC News. You can get married at 16 - or even younger in some states. You can drive a car - an incredibly dangerous task - at 16. You can vote for government officials at age 18, and at that same age you can kill and be killed in the name of that government. By age 18 you're mature enough in the eyes of the law to do all those things, which involve significant risk and significant responsibility. But beer? Apparently it's so dangerous that you have to attain the age of 21 before you're considered by the government to be responsible enough to dare to give it a try. I say "considered by the government" because we all know a few people who aren't responsible enough to handle alcohol even after they turn 21. I submit that it's this prohibitionist policy that made some of them that way. Some people even have such a fear of beer that if you happen to enjoy of in the presence of your kids, you might be accused of child endangerment. "Land of the free", indeed. I set up today's Impromptu Pale Ale brew around 9:00 this morning, and started mashing in at 9:37. When the boil ended at 12:50, I started mashing in a batch of Tin Lizzie Hefeweizen. Both batches were in the fermenter and I was done cleaning up by 5:45. It's the first time I've brewed two batches in the same day at Gottberg, and it went pretty well. The worst part was the weather: the temperature and the humidity were both well into the 80s all day, and the brewhouse steamed up pretty good. Tomorrow: fill a metric shitload of root beer kegs. Made a seven-barrel batch of root beer with the last of the sugar I had on hand. I got an order from Norfolk for fifteen barrels of root beer, which is just about exactly how much I have on hand. I'd like to make some more, but I called the Dorothy Lynch plant to see if I could borrow a ton (actually 2,400 pounds) of sugar, and they said they didn't even have enough for this week's salad dressing production and they weren't sure when the next shipment of sugar would arrive. So we might just run out of root beer this weekend. Filled a few kegs for the pub. I'd like to brew tomorrow, so I filled up the hot liquor tank and turned on the steam. After a while the water was plenty hot, but the digital display said the temperature was 32°F. I swapped out the probe to no effect, so I stole a controller from one of the fermenters and the problem was resolved. So I will be brewing tomorrow! Paris returned to Omaha this morning, and as usual we had lunch at the Crescent Moon Ale House and bought a few bottles next door at Beertopia. We got home around dinnertime and fed the cats and planned to have a quiet evening at home. 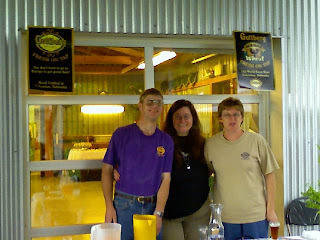 The phone rang around 8:00; it was the bartender at Gottberg. She said there was a guy at the bar who had been using my site for years to plan his travels, and he'd like to meet me if possible. Why not...we walked over to the pub. At the bar was one Christopher Bay, from Detroit. He was wending his way home from seeing his daughter in New Mexico, stopping at breweries along the way. Twenty breweries, in fact, in the last two weeks. We talked about beer and we talked about breweries and he showed us his pictures and we drank more beer and the pub was about to close. We told Christopher to park his camper in our driveway, then we got into my cellar and drank more beers. (I'll have to sort through the empty bottles to figure out just which ones.) A good time was had by all. After this morning's medical appointment — they're sending me to a spine specialist in Omaha — I went to the brewery and rinsed the acid out of the mash tun, kettle, and heat exchanger, then packed the HX with sanitizer. At noon, the Brewers Association presented one of their online web-based educational opportunites. This month's Power Hour, on the subject of Ensuring Draft Quality in the Brewhouse and Beyond, was presented by Upstream Brewing's Zac Triemert, who talked about controlling beer quality during the brewing process, and Tom Geordt from Micromatic, who covered draft line maintenance. Very interesting and important stuff. I started catching up on my long list of things to do this week, having been quite a slacker recently. Filled kegs of beer for the pub and root beer for the wholesalers. Cleaned a couple dozen picnic taps. Threw away a bunch of trash in my office. Circulated acid through the heat exchanger and kettle for an hour. I'll let it soak overnight, then rinse and sanitize it tomorrow. Soaked the mash screens in acid to be rinsed tomorrow. Tomorrow: see if I can get some sugar and make 28 barrels of root beer. Kegs are expensive. Breweries pay lots of money for their cooperage. It has never made sense to me that we can charge only a $10 or $20 deposit on a piece of equipment that costs up to fifteen times that amount to replace. Retailers and consumers might not like it, but I think Michigan's action is a step in the right direction. 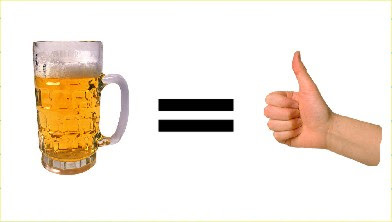 Besides, paying a larger deposit doesn't make the purchase more expensive, since you get that money back when you return the keg to its rightful owner. Which reminds me, scrapyards that buy kegs from the scumbags mentioned in the article are guilty of receiving stolen goods, and should be prosecuted accordingly. Buying a keg for your next party is a little more expensive. Large breweries have complained about losing thousands of beer kegs a year in Michigan because retail beer customers have been selling off the stainless steel barrels at scrap yards rather than returning them to stores to get their $10 deposit back. As a result, state alcohol officials have boosted the deposit from $10 to $30, The Bay City Times reported Sunday. Read the entire article at IndyStar.com. Here's an interesting concept that will probably face some legal tests in the near future. Ain't the Internet grand? [Steve] Cohn and two friends started a business called BuyYourFriendADrink.com, a Web-based operation that allows folks to buy a friend a drink - whether across town or across the country. The trio raised $500,000 and started signing up bars. So far, BYFAD has signed up 60 bars, mostly in the New York City area, although, Cohn said, it is expanding into the Boston area and is signing up about five bars a week. Read the whole article at NYPost.com. 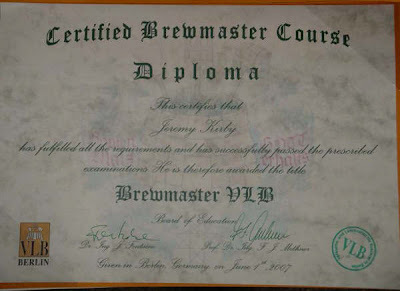 Exciting news from Berlin: Jeremy Kirby, formerly my rented mule, graduated last Friday from the renowned Versuchs- und Lehranstalt für Brauerei! Jeremy says he may be headed to Münster for a one-month apprenticeship. I heartily congratulate him on his accomplishment, and wish him all the luck in the world with his new career! I guess my idea about "drinking less and typing more" hasn't taken root. Tuesday, May 29: Cleaned the draft lines. Cleaned a boatload of kegs. Crashed the Hefeweizen to drop some yeast out in preparation for transferring it to the cellar later this week. Wednesday, May 30: Ran a five-gallon keg of root beer over to Crackers to Caviar, my nearest customer outside the pub. Caught up on invoices and phone calls. Dumped trub out of the Rye Lager, Hefeweizen, and Gold. Thursday, May 31: Filled kegs. Went to a fun tasting event at our local Hy-Vee store this evening; they were introducing beers from Big Sky Brewing (Missoula MT) and Left Hand Brewing (Longmont CO). Saturday, June 2: Drove down to Denton and poured Uncle Ivan's Dunkelweizen and Impromptu Pale Ale at a fundraiser for the Lux Center for the Arts, held at the Spring Creek Prairie Audubon Center. Empyrean Brewing and Spilker Ales also brought some beers, and a good time was had by all. Monday, June 4: Filled some root beer kegs for the Grand Island wholesaler. Did the monthly tax reports. Kegged the rest of the Hefeweizen, cleaned and sanitized the tank, and transferred the new batch. Tuesday, June 5: Cleaned the draft lines. Got a phone call from Skeeter Barnes in Council Bluffs, Iowa saying they were down to half a keg of root beer, and they needed four kegs right away. So I filled them and drove them out there. Transferred 14 barrels of root beer into the cellar. Tomorrow: Clean and fill kegs, and clean the pile of picnic taps that came back wit all the root beer kegs. Whee.